Special occasions usually translate into special meals, and Valentine’s Day is no exception! There is no better gift for your significant other than a gift that is homemade food. Call the babysitter or call the dog-sitter because things are about to heat up in the kitchen this Valentine’s Day! Typically folks don’t mind splurging when it comes to meals and holidays. Why can’t something be prepared to eat that is satisfying, flavorful, and healthy? New Years has just barley had time to start passing us, and for this Valentine’s Day I am here to help everyone stay on track with their resolutions! You will not be unhappy, or feel as if you have just consumed a cardboard box. You will not fall asleep snoring while rabbits finish up your entrée. Weird textures and products made from soy shall not take over your pallet! Now, lets began the preparations shall we? This may seem overwhelming, but it is not! You can do it! I promise you can do it, and you can have fun doing it, too! I always like to start with dessert first. Who wants to spend time preparing dessert after a nice meal? The only thing that you shall have to do is put the parfait together! Valentine’s Day lands on a Sunday this year! Friday is the 12th, and this is the day we shall begin dessert! On Friday place your can of coconut cream into the fridge to sit over night. Wash, and remove the stems of all of your strawberries, but leave one in tact for a garnish later. Place your sliced strawberries in a bowl. Now cube up your mango, and place it in the bowl of strawberries. Sprinkle the organic cane sugar over the fruit, and add in the lemon zest. Give it all a good mix, and place it in the fridge to marinade until Sunday! On Saturday remove the can of coconut cream from the fridge, and turn it upside down. Open up the can, and pour out the excess liquid. You should be left with only the thick coconut cream. Spoon out the cream into a mixing bowl, and combine it with the honey, vanilla, and cayenne pepper. Using a hand held or stand mixer with a whisk attachment mix for about 4-5 minutes. The mixture should be smooth, fluffy, and light! Spoon it out into a bowl, and pop it into the fridge for Sunday! Now lets toast up some almonds. You can use the oven, or a small frying pan on the stove. In the oven: Preheat to 350, and sprinkle a good handful of sliced almonds on a sheet tray. Pop them in the oven for 10-12 minutes monitoring closely to ensure they don’t burn or over brown. I prefer mine lightly toasted, but you can go darker if you like. At the half way point take them out of the oven to mix them around so they all brown evenly. On the stove place a handful of almonds in a small frying pan, and turn the heat on medium high. Constantly keep the almonds moving to ensure even browning. I simply shake the pan with one hand, and use my free hand to mix the almonds quickly with my fingers. If you’re worried about burning yourself a small spoon does the trick, too! When the almonds start to brown remove them from the heat, and keep stirring them around because the pan is still hot the almonds will continue to cook until you remove them from the pan. Let them cool off, and put them in a ziplock bag for safe keeping! We will finish this dish on Sunday. I’m going to start this meal off with the quinoa first because it takes the longest to cook. By the time the quinoa finishes cooking everything else should be done to plate up, and still be hot. Quinoa is a healthy alternative to rice or potatoes. Its loaded with protein, potassium, and a good amount of fiber! I prepare quinoa the same way that I prepare rice, and I even use a rice cooker to make it in! Before we begin, preheat that oven to 350 for the fish! In a rice cooker combine quinoa, broth, and coconut oil. Quinoa takes about 30 minutes to prepare in a rice cooker. After it is done mix it well with the cashews, craisins, and orange zest. While the quinoa cooks it is time to begin the main dish! First things first time to prepare the veggies. I used a small mandolin to ensure same size cuts, and to reduce the time that it takes to slice by hand. After all of the veggies are sliced place them in a bowl, and season them up with a good amount of salt and pepper. Set aside for later use. Remove the rosemary from 1 spring, and combine it with the gluten free flour. Season the flour with salt, and pepper. Give it a little taste to make sure you have enough. Place an all metal sauté pan on the stove, and turn the heat to medium. While the pan is heating up rinse off your halibut under cold water, and pat dry with paper towels. Season one side with salt and pepper, and bread the other side in the seasoned gluten free flour. Now the pan should be nice and hot. Lets add in the olive oil. There should be enough to coat the bottom of the pan, but not enough that the fish is having another swim during its second life! Place the fish flour side down into the pan, and let it cook for 4 minutes. Throw in a spring of rosemary, and give it a good swirl with the oil. Remove the pan from the heat, and place it into the oven for two minutes. Remove the hot pan from the oven, and flip the fish onto the other side. Be careful, use hotpads, and don’t burn yourself! Place the pan back into the oven, and allow to cook for another 2 minutes. Remove the fish from the pan, and allow it to rest crispy side facing up. Remove the rosemary spring. Using the same pan with the same oil place it back onto the heat, and add in the veggies. Allow them to sauté up for a couple of minutes just to give them a light cooking. They should still be crisp, but hot. By this point the quinoa should be done. Don’t forget to toss it with the cashews, craisins, and orange zest after it cooks! On my plate I spread out some nice baby spinach leaves. I spooned out some of the quinoa on the baby spinach followed by some of the veggies resting up against it. I placed the fish up against it to make sure that crispy side really stands out! I left some of the veggies in the pan, and I am going to place it back onto the stove for the sauce! Its time to add in that splash of white wine with those remaining veggies, and crank the heat up. Let it come to a boil, and reduce down a little bit. Remove the pan from the heat, and mix in the mustard and yogurt, Give it a sprinkling of salt and pepper, taste, and add more if need be. Spoon out the sauce onto the fish, and a little on the plate if you like for a classy touch! I garnished this baby off with a simple lemon wedge resting on the back of the fish! Remember the lovey fruit, toasted almonds, and whipped coconut cream? Its time to put these babies into play for dessert after your stomach settles! For dessert I think they should be intimate, and I think they should be shared. For these reasons I selected a large enough parfait glass that two people can easy enjoy together in an intimate setting. I started off by putting a large star tip into a pastry bag, and filled it up with the whipped coconut cream. If you don’t have the bag or tip you can spoon it on, and spread it out in a neat manner using a small rubber spatula. In my parfait dish I placed a spoonful of fruit mixture followed by a sprinkling of toasted almonds, and a layer of whipped coconut cream. I continued this process a few more times creating layers until I reached a point where I felt it was getting high enough to top off with just one more layer of whipped coconut cream. 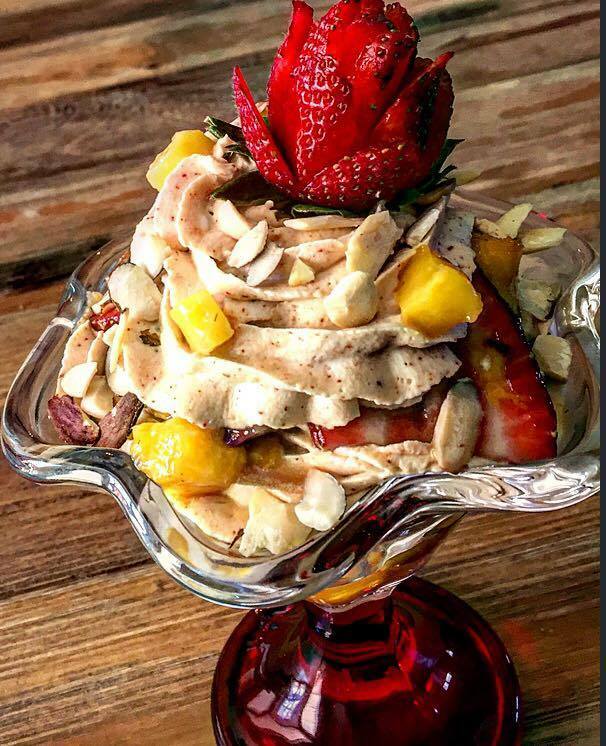 I sprinkled the final top layer with toasted almonds, and placed a strawberry rose on top for garnish with a few small cubes of mango! You can simply use a strawberry fan, or arrange strawberry slices on top neatly if you don’t know how to make a strawberry rose. The real key for the rose is to use a small sharp paring knife. Place a medium sides strawberry upside down on its stem, and map out the sides. Cut down and into the strawberry about half way up on each side, and gently spread each petal apart. Repeat the process over until you reach the center careful as to not cut off petals or cut all the way down into the strawberry. Once your done with all the cuts gently spread the petals apart to create a rose! 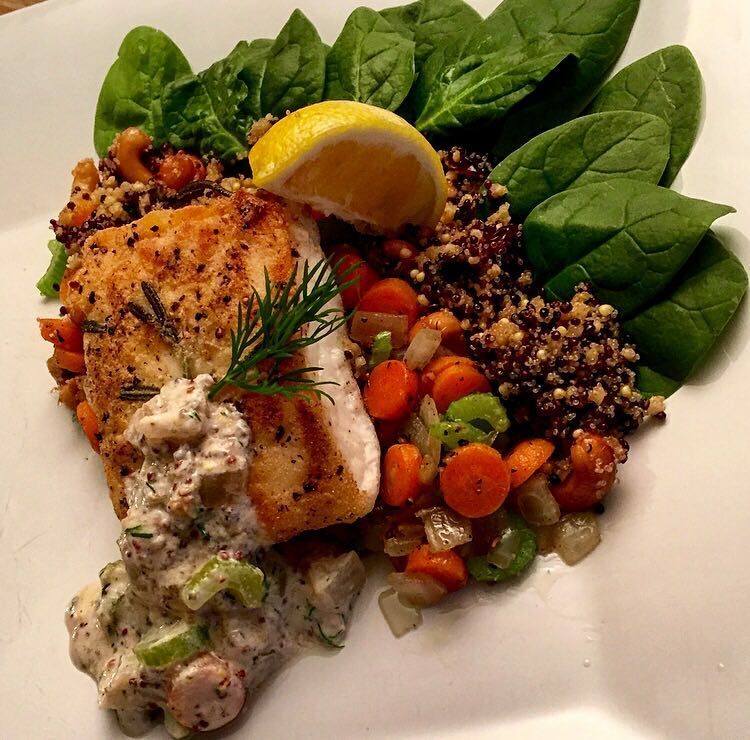 I hope that you, and your special someone enjoy my fresh take on healthy cooking! Healthy doesn’t have to be boring, or bland! Happy Valentine’s Day everyone! 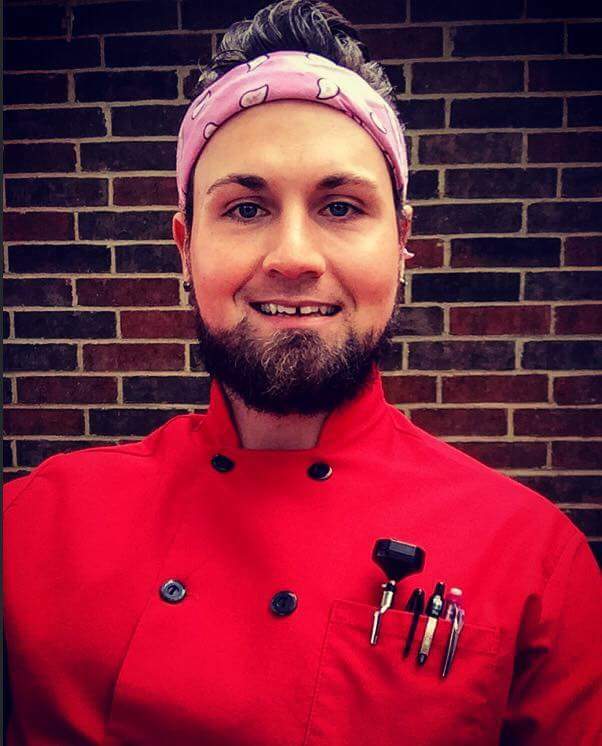 We love working with Chef Shawn! He always provides beautiful, delicious recipes! Great looking dishes, love the recipes and the presentation. Can’t wait for more from Chef Shawn! Us too! He is a huge talent and we’re fortunate to work with him every chance we get! You will definitely see a lot of Chef Shawn!